Due to commence their first year of operation, traditional white washed cave-house villas meet minimalist modern decor in this luxurious chic space. Set in the heart of Fira, the scenic capital of Santorini , Infinity Collection boasts an outdoor heated pool and spa, sun terrace and modern white decor in traditional cave-style accommodation . Free WiFi is available throughout. 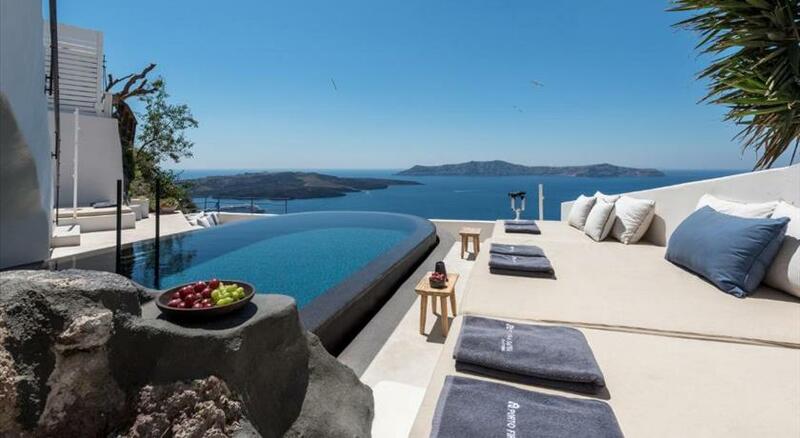 Boasting views of the east coast of Santorini, all units feature a flat-screen TV with satellite channels and kitchenette with tea and coffee facilities. Bathrooms include a walk-in shower, free toiletries and hairdryer. Heating and cooling come standard. The property offers a free shuttle service, as well as bike and car rentals. Excursion activities are also organised. The nearby available choices range from an abundance of bars and restaurants to sophisticated art galleries and museums. Santorini Airport is at 7 km. Please inform Infinity Collection Fira - Adults Only in advance of your expected arrival time. You can use the Special Requests box when booking, or contact the property directly with the contact details provided in your confirmation. Kindly note that children under 6 years old cannot be accommodated. kindly note that all room types are designed in cave-style architecture.